Length of Walk: The walking part takes you through the community area of East Side and totals 3 miles. We’ve added a 15 mile drive of other highlights in the area with an emphasis on its industrial activity, past and present. 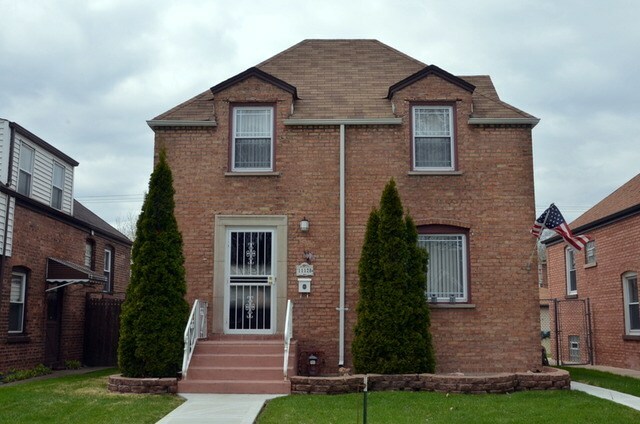 This drive takes you through East Side, South Deering and the south end of South Chicago. How we got there: We drove, entered the Powers State Recreation Area, parked and started our walk of East Side. After our walk, we took the #30 bus back to Powers. We got our car, then drove the 15 miles add on route of more East Side, South Deering and South Chicago. You can check other public transportation options with the CTA Trip Planner. As a child, I remember driving through this area on family trips, awestruck at the sight of the gargantuan steel mills and their belching, smelly smokestacks. It was unthinkable they could ever disappear. To visit this area today is equally awe inspiring in its transformation. Remnants of industry still remain, but green space, parks, family homes, and big aspirations for development are now the focus of the area. Our walk will focus on life in the East Side community and our drive will highlight the area’s industry, past and present. We were lucky to have personal tour guides for this walk! Bobby Loncar, a lifelong resident and attorney, reached out to me after seeing our blog. He generously offered to give us a tour of East Side and is an energetic promoter of his community and its many attributes. He asked Christopher Rodriguez, a fellow lifelong resident, to join us for his perspective. 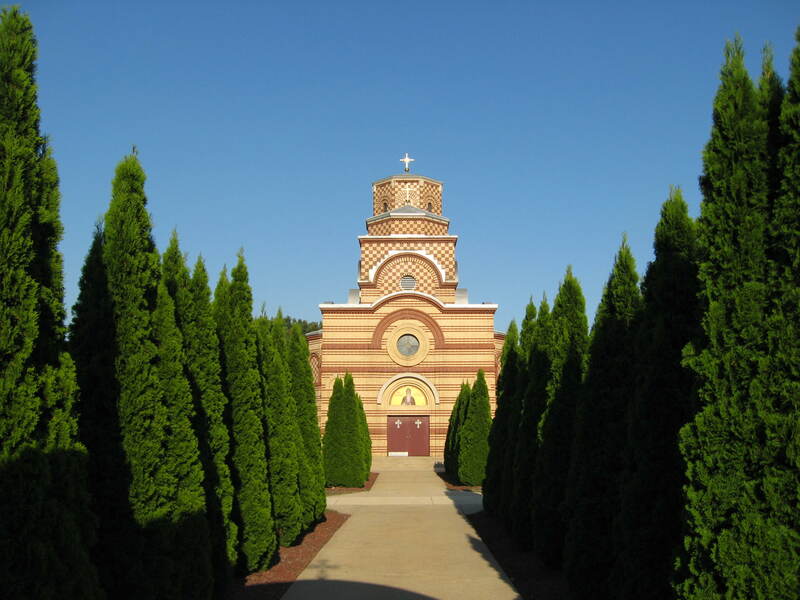 Bobby’s father emigrated here as a young boy from Croatia in 1968 and his mother emigrated here from Germany in 1980. He was born and raised in this neighborhood and is married, raising his own three children with his wife, a fellow long time resident of the community. Many of their relatives still live here, often just blocks away from them. Christopher was raised in a Mexican and Irish household and is also a South sider for life. Even though he commutes 1.5 hours one way to his job up north, he cannot imagine living anywhere else. He has deep roots in the community and nowhere else would seem like home. Both Bobby and Christopher lament that even though East Side has a lakefront park, forest preserve, state recreation area, abundant retail, affordable housing, reasonable real estate taxes, proximity to downtown (13 miles away) and a small town feel, the area does not get attention from potential residents and is overlooked as a residential choice. They work tirelessly to bring attention to these attributes and hope the day comes when their neighborhood gets “discovered’ by families and others looking for such qualities. What is so unusual about East Side is that it is a small town hidden within Chicago. With a population of 23,000, many people know each other. Kids play safely and the modest homes are well kept. This community borders Indiana and is one minute from the Skyway and the casino. Real estate taxes are some of the lowest I have seen anywhere in the state, including my depressed hometown of Decatur. There is a window of time when people will realize that this community is affordable, comfortable and easy to drive to with plenty of parks and outdoors. When the window closes, it might very well get gentrified. A very pleasant walk any time of the year. East side is one of the 77 official community areas of Chicago. It is located between the Calumet River and Indiana state line, just south of 95th St.
East Side, until recently, was socially and economically dominated by the Calumet River and the jobs it supported. The community got its name from the river because it was located on its east bank. The river formed the once-thriving industrial Port of Chicago. A cluster of riverside docks and slips allowed materials of all sorts to be loaded and unloaded onto adjacent railroad lines, and the river itself was lined with steel mills. Republic Steel began operations here in 1901. The Republic mill was the site of frequent union unrest, culminating in the Memorial Day Massacre of 1937 and the successful drive by the United Steel Workers to organize the Chicago mills. Many of the neighborhood’s residents during this period were families of Slovenia, Croatian and Serbian heritage, who had emigrated from Europe to work in the steel mills and take related jobs. In the 1950s, the East Side was divided in two by the Chicago Skyway. The riverside steel mills and heavy industries went into serious decline in 1970-2000, and are no longer the mainstay of the neighborhood. 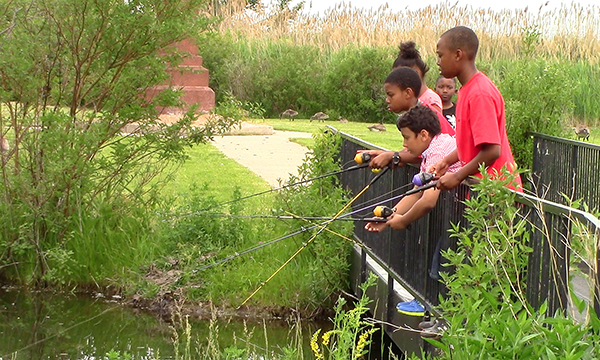 Currently, there are proposed plans to expand East Side’s Calumet Park and Beach, and to extend the existing lakefront bicycle path to the proposed new lakefront parklands in adjacent South Chicago. 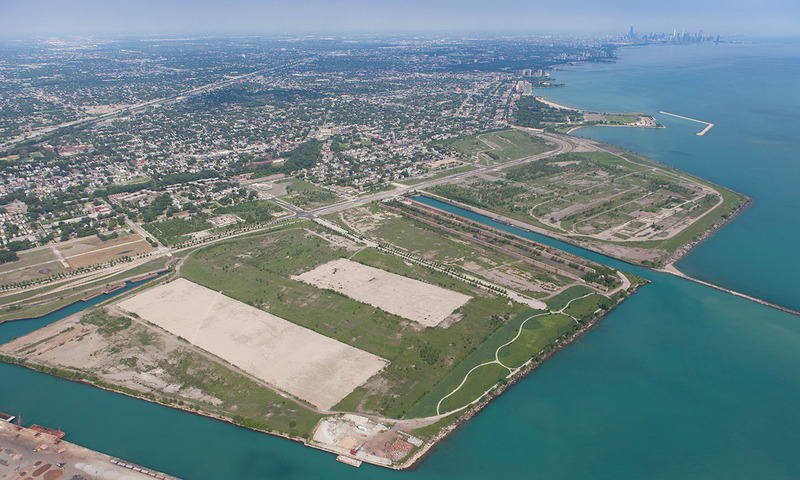 This proposed future expansion of Chicago’s southern lakefront parklands will result in the connection of Calumet Park to Rainbow Beach, the South Shore Cultural Center, and Jackson Park. Today, the area is largely Hispanic and residents work primarily as city workers, white collar or in non-production jobs. This is the only state park within Chicago. This park consists of 580 acres of which 419 are water. It encompasses Wolf Lake which provides outstanding fishing. It straddles the Illinois and Indiana state line. If you fish off the peninsula marked by 1A on the map and plan to fish on both sides of the bridge, you will need an Illinois and Indiana fishing license. Otherwise you can buy one license and fish only on that side of the bridge! 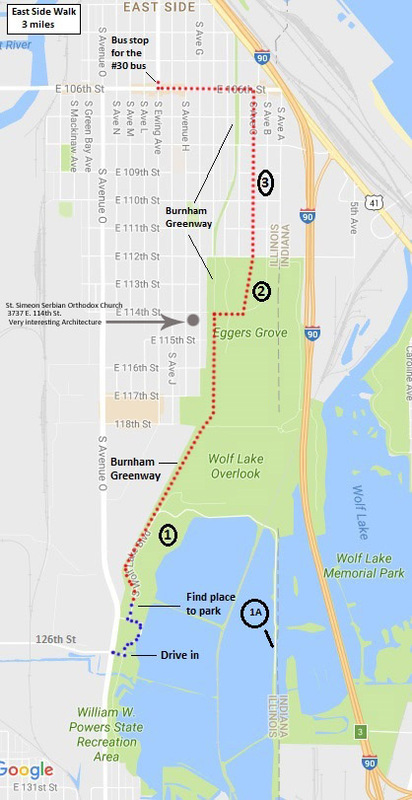 Once you’ve had your fill of the park, head to the westernmost part of the park and pick up the Burnham Greenway. The trailhead is on the left about 0.5 miles ahead along the park road. Stroll along the neat and well-kept residences along Avenue C to get a feel of how people live in the neighborhood. When you get to 106th Street, make a left (west) and walk through some area retail. There are many ice cream shops to enjoy! When you get to Ewing Ave., you can wait for the #30 bus on the northwest corner. There is more retail up and down Ewing Ave if you want to browse before the bus comes. Catch the bus and head back to the Powers Recreation Area to pick up your car. The Port of Chicago consists of three facilities in this area: Iroquois Landing for ship cargo, Dougherty Harbor (terminals and harbor operations on Lake Calumet) and Harborside International Golf Center. There must be a story about how a Golf Center ended up in this industrial area run by the Port Authority, but I don’t know it! You can’t get into the Harbor operations, but as you make your way to the golf center, you will see glimpses through fencing. Once you get to the Golf Center, walk out to the back deck to view the golf courses as well as an expansive view of Lake Calumet and its terminals. The Port of Chicago is run by the Illinois International Port District and under fire for underperforming in its management of this strategic asset. The City of Chicago has called for privatization and the Civic Federation has called for the dissolution and restructuring of the District, arguing that the District has no strategic vision or accountability. 106th and S. Bensley Ave.
Trumbull Park (2400 E 105th St.) is located next door and features a classically-designed Beaux Arts fieldhouse built in 1914, as well as a magnificent stand of gingko trees in its central plaza. It is also listed on the National Register of Historic Places. 3. Calumet Fisheries, 3259 E 95th St. This famous fishery is known for smoking their own fish on site. This is the scene of the famous “jump” over the drawbridge in The Blues Brothers movie. Another famous eatery whose specialty is hot dogs. This is part of the Port of Chicago and one of the largest stevedoring (cargo loading and unloading off ships) sites in North America. You can’t get in here, but if you pull in the driveway on your left (north) off 95th street just after crossing Ewing and drive up to the gate you will get a glimpse through the fence of the massive cargo yard. Who knew this was here??? It has the same impact in its gargantuan presence as the steel mills once did! This park is where it is happening in SE Chicago!! We’ve walked this park twice and it has been jam packed with activity both times. On the day we took the walk through East Side, it was so hot and humid that Powers Park and Eggers Grove had almost no visitors. Once we arrived in Calumet Park, we could barely drive. There were people everywhere. And for good reason. This lakeside park of 200 acres offers a beach, boat launch, softball, football, and soccer fields, picnic groves, playgrounds and a fieldhouse with extensive programs. 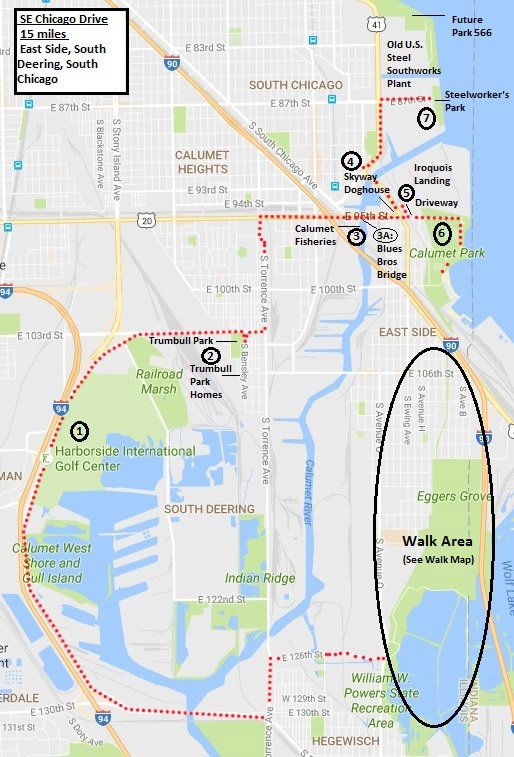 As mentioned earlier, the proposed future expansion of Chicago’s southern lakefront parklands will result in the connection of Calumet Park to Rainbow Beach, the South Shore Cultural Center, and Jackson Park. Though a few remnants like old stone walls and tunnels remain on this property, the steel mill has been completely dismantled. Steelworkers Park exists on the east side of the southern portion and Park 566 is planned for the east side of the northern portion. A mega development project between U.S. Steel and McCaffery Interests slated for the balance of the 430 acres officially died this year after 12 years of planning. U.S. Steel is now selling the property outright. DNA Info reports that, “The project is being rebranded as 8080 Lakeshore and Cushman and Wakefield have come in as the brokers. The group is marketing the land as close to Hyde Park and the future Barack Obama presidential library and the historic Pullman neighborhood, and are casting a wide net in search of industrial, research, entertainment, residential and mixed use projects.